From the top menu, click the Tools option followed by Account Settings. You should then click the New button. Tick the "Manually configure server settings or additional server types" box towards the bottom of the window, followed by Next. A window will pop up requesting you to choose between different server types. Please select "Internet E-mail" and click Next. 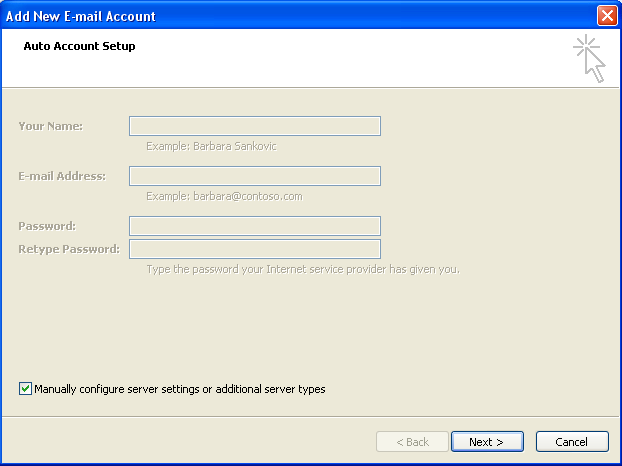 For the user name, enter the email account you've previously set up in the control panel. In our example, this is bob@domain-name-here.co.uk. 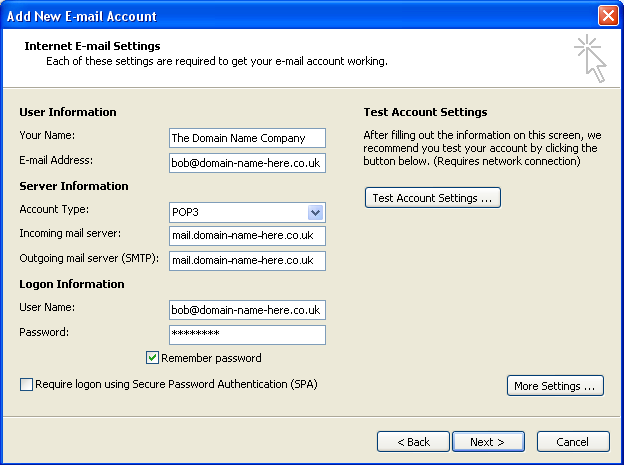 This does not mean that only emails sent to bob@domain-name-here.co.uk can be received as you can set up a forwarder so that mail from other addresses can also be received into your email account (mailbox). The user name here is purely to access the mail waiting in that email account. 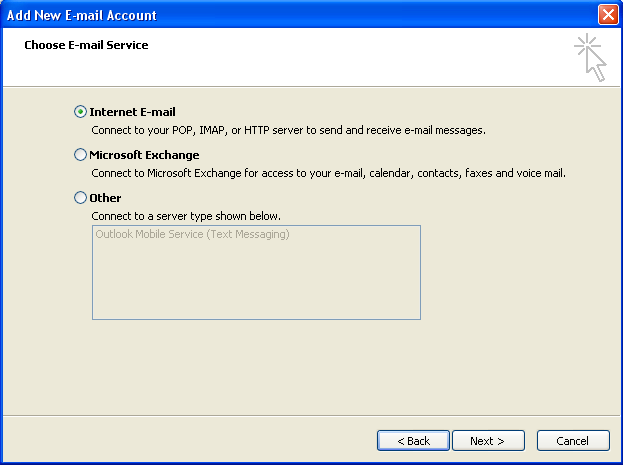 If your outgoing mail server is the same as your incoming mail server, you must now click the More Settings button to open the "Internet E-mail settings" window. 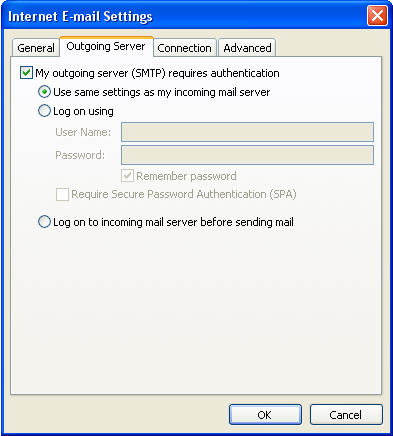 Select the Outgoing Server tab and make sure there is a tick in the box marked "My outgoing server (SMTP) requires authentication". If this is not done, you will not be able to send emails beyond our network. The default settings for this program will leave mail on the server indefinitely and this WILL cause you problems in the future. 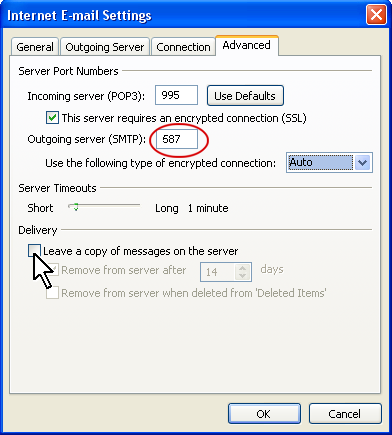 Therefore we recommend that you remove the tick from "Leave a copy of messages on the server". Click OK, Next, Finish and Close.